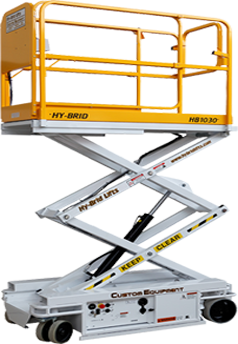 A major player in the scissor lift industry just strengthened their position. JLG Industries, based in the PA towns of Shippensburg and McConnellsburg, has announced some improvements with their line of scissor lifts. A recent news release confirmed what many of JLG’s customers already suspected: the RT and ES lines of scissor lifts were tweaked to decrease total equipment weight, increase durability and also make repairs and maintenance easier than ever. Any time a main scissor lift manufacturer makes changes to their equipment, there’s bound to be talk within the industry. And the recent buzz hasn’t gone unnoticed. To supplement the overall strength and performance attributes on the ES, JLG also substituted rail locking handles with a more convenient locking foot lever. This mechanism helps release extension work platforms for each model. For the ES models, those extension surfaces are now made with diamond plate steel, among the toughest and most durable on the market. Some other lifts, notably the 2030ES and 2630ES, now feature wider operating bases to help reduce any instability. In fact, their model names have been updated to reflect the additional 2 inches; they’re now the 2032ES and 2632ES, respectively. One of the world’s best-known equipment manufacturers, JLG is owned by Oshkosh Corporation. Relentless changes to existing equipment lines means you have to stay on top of any safety standards that may be impacted. Or, instead of doing all the work yourself, you could let CMO handle your aerial work platform (AWP), aerial lift or scissor lift program. CertifyMeOnline.net supplies small and large firms with the training necessary to become OSHA compliant. Let our experts help you today. Please call our team at (602) 277-0615, or visit the CMO contact page and get in touch today. Thanks for reading the CMO blog. Is your company using any new JLG lifts? Drop us a line and let us know what you think!